Welcome back for Day 2 of the August Papertrey Ink countdown. Today I'm here to deliver the goods on my two new die collections, available August 15 at www.papertreyink.com. So get a cup of coffee...or tea...or water... and take a few minutes to learn about what cool things they can do in this how-to video. How to make wrist cuffs for a super hero costume. If you are so inclined. Seriously. 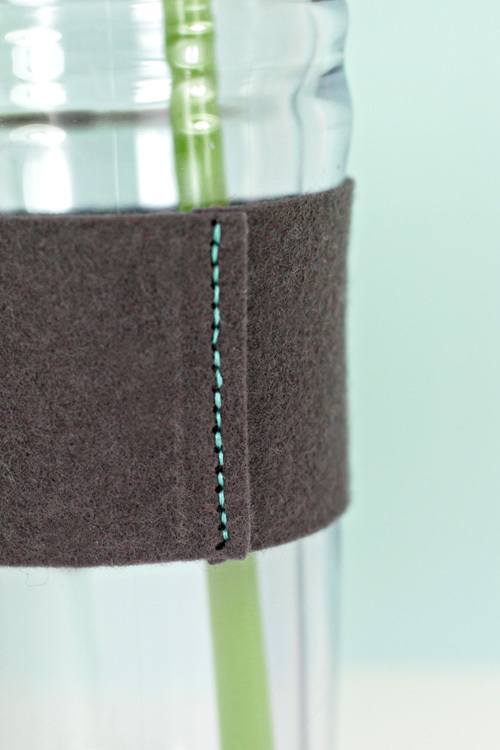 Paper cozies are nice and all, but it is really all about the felt. 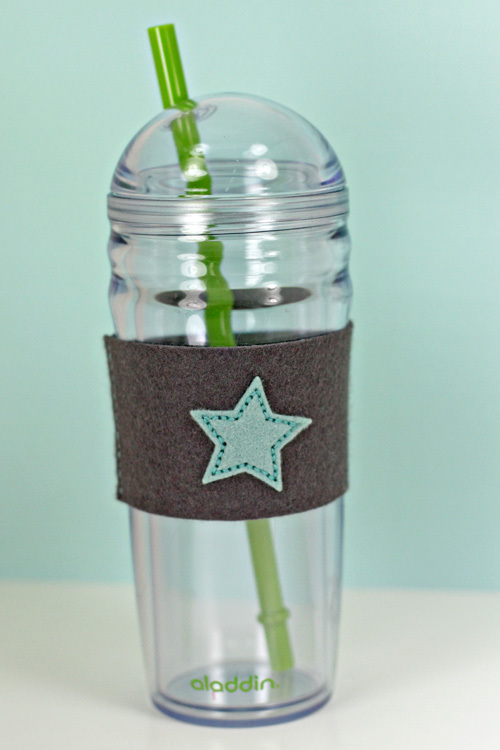 Here's the most basic of felt coffee cozies with a felt star stitched directly into the front of the cozy. The Coffee Cozy Detail Collection dies allow you to put just the holes of the star on the main felt piece. There is a second star die that cuts both the star and the holes. Line 'em up, and stitch 'em in. Very easy. This is an Aladdin cup that I found at Target for $9.99. Good for cold drinks. My husband has called dibs and refers to it as "the perfect Slurpee cup". Included in the Coffee Cozy die set is an optional edger style die that allows you to add stitch holes to the edges. This makes it all the more easier to stitch them up. The paper cozy I showed you yesterday? No holes! It is nice to have the option of both, depending on your material. We are all about versatility. Here is a card and cozy combination. To be honest, I created the card with the last release and it never got used. Once I had used the Quick Stitch Sentiment dies (previously released) on this Autumn Rose and Winter Wisteria felt cozy, I realized how well they went together. The font used in Scrolling Sentiments matches the font used in the word die. BONUS! Here's a close up of the cozy details. I used the star again from the Coffee Cozy Detail Collection dies. 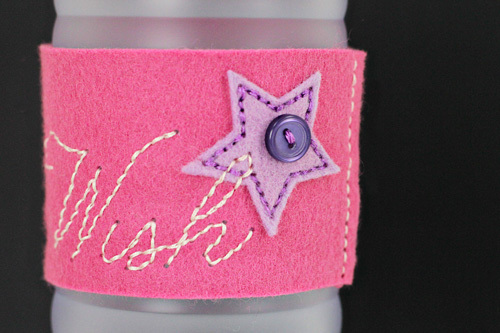 It is overlapped with the word "wish" from the Quick Stitch Sentiments. It was a bit tricky to get this all lined up, but very doable. I first cut the stars (both just the holes directly in the cozy and the individual shape). 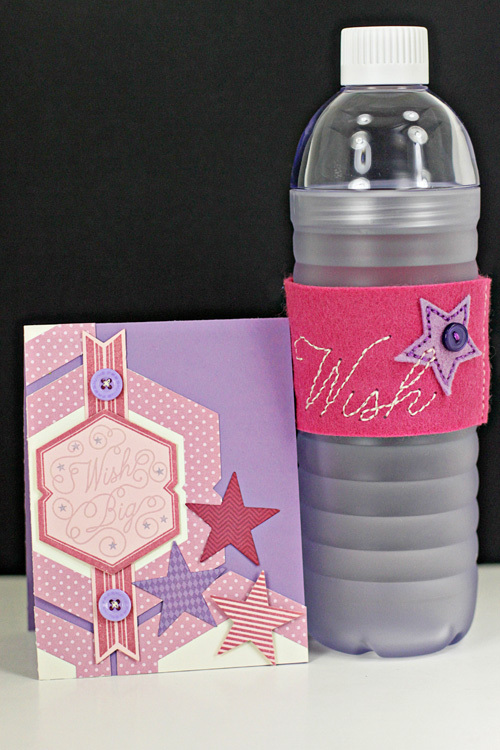 Secondly, I placed the coffee cozy piece and the star piece in my die cut machine with the holes lining up. And lastly, I ran it through with the word die placed on top, cutting holes in both the main coffee cozy piece and the star accent. In the end, I've got holes that line up on overlapping shapes. Here's a fun twist for you. 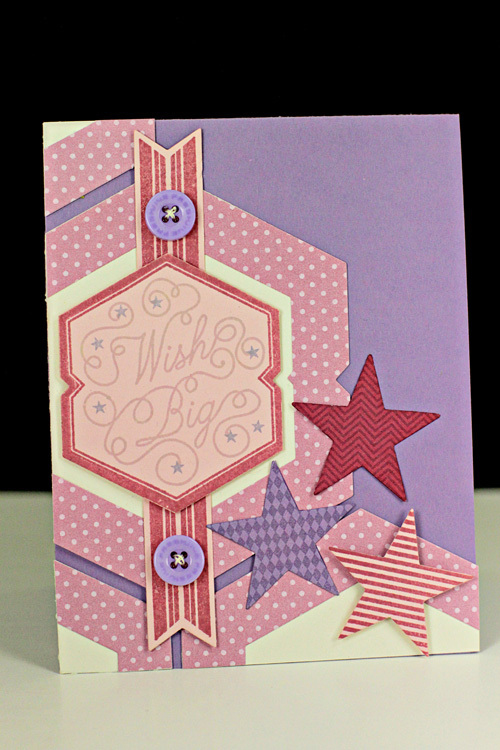 I used the edger-style stitching hole die to place holes in a paper banner cut. I stamped it with Dawn's new "Mum's the Word" stamp set (available this month) and stitched it directly in the seam of my coffee cozy. It can be cut or ripped out like tags in pillows and mattresses. You know, the ones that are "illegal" to remove until purchased? Snicker. 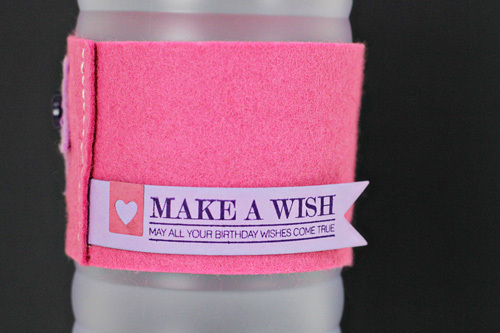 This little trick allows you to add larger sized sentiments directly to your coffee cozy for gifting. The little heart tag is part of the Coffee Cozy Detail Collection dies. Quick shot of the card alone. It uses Scrolling Script, Mat Stack 7 dies, Bitty Background Blocks II, and First Place stamps and dies. 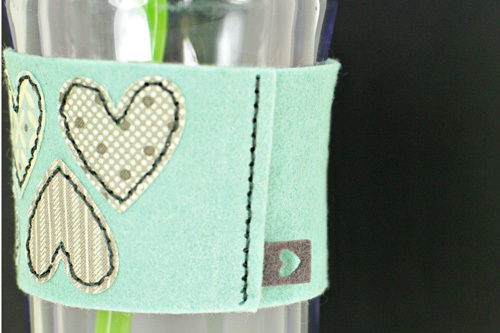 And lastly, we have a felt coffee cozy featuring hearts from the Coffee Cozy Details Collection dies. I cut them out of fabric backed with a stabilizer such as Heat-N-Bond to ease the cutting. They are stitched into the cozy. 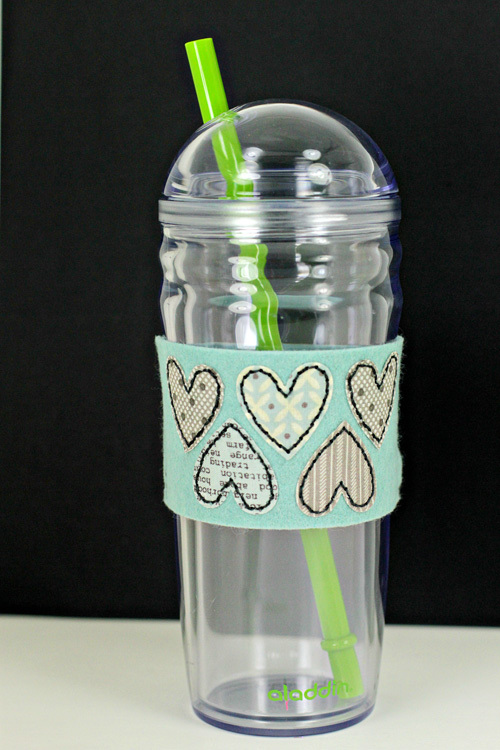 A final shot of the little matching heart tag in the Coffee Cozy Details Collection. There is one to match all three of the shapes (heart, tree, star). It comes with three holes in the top, so you can stitch it into the seam of your coffee cozy. Cute little detail. And that is that. Until tomorrow. There are still fun things to explore. Particularly with the Coffee Cozy Details Collection. These are so fun. Any combination of felt, fabric, and paper can be used with them. A dozen or so possibilities. These are worth their weight in gold. So excited to get these Erin!! You have thought of it all. Thank you for finally bringing this to us!!!!! Love it! Oh my Erin just WOW!! You rock!! I am so excited for this! I am seeing Christmas gifts and the idea for super hero wrist cuffs!! I know a 5 year old who is going to love these!! Brilliant, Erin!, I love the thoughtful little tiny tags to add at the seam ... So cute! You are just brilliant! Nuff said! Wonderful design and details. Everything to make these fun to make and to use! Such a cute video. What a fun idea...love it Erin! I just had to comment. This idea is genius! I cannot believe what a great, yet economical gift this would be for some one who loves coffee and tea. I think you are right, we need to get more of the detail dies, Halloween version, St. Patrick's Day, flowers, the possibilities are endless. Super cute and what a fabulous idea....genius the way you designed the stitches too!!! Oh my gosh - these are adorable Erin! There are so many autumn/winter gifts possibilities. Fabuloso tutorial. Being "all-thumbs" I probably wouldn't have been able to figure this out without instructions (not the brightest bulb when it comes to assembling stuff). Also, appreciate you sharing how versatile these dies are. Thanks. WOW this will be a must have. I love all of your coffee cozy. I can't wait to add craft collection. Awesome! Love the little detail tag the most! Really takes it up a whole notch. Genius Erin! Terrific video on coffee cozys. The little tag just puts a finishing touch on the cozy. Beautiful card too. Can't believe you didn't show the Wish Big card last release. It's beautiful! Well, man, those coffee cozy dies are just fantastic!!! What a perfect, practical idea. Love it! I love everything that comes out of your creative little mind. These are adorable with endless possibilities. I didn't get to watch last night because DH was asleep and I was reading blogs in bed - but I watched this morning. I must have these, Erin! I love the detail dies and the little tag. That little tag is the *perfect* finishing touch. Love it!!!! Erin, I can't wait to buy this set and I'll be mass producing this project for Christmas. I also was so excited to see the electric Big Shot. Can you please tell me where you bought this? I have an extremely bad shoulder and this would help me out so much. Thanks.